Oyez! A new issue of Goblin Fruit has landed! There will be one more issue of Goblin Fruit this year, imminently, landing in mid-December. Then, next year, hopefully the climate change that's been wreaking havoc with our poemic seasons will have settled into regularity again. 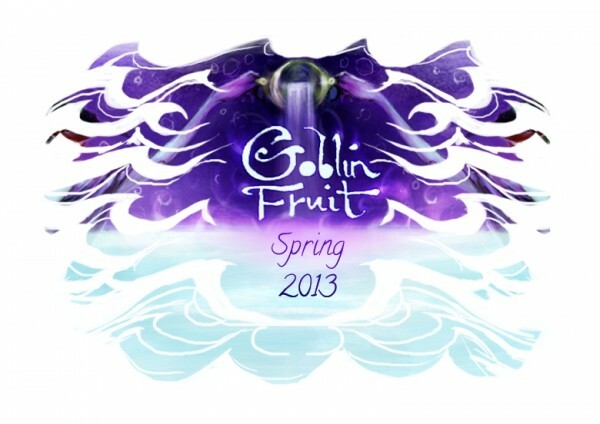 Closing out the season but partaking of it nevertheless, the Spring 2014 issue of Goblin Fruit is live! In it you'll find poems by Sara Norja, Alexandra Seidel, Jennifer Schomburg Kanke, Claire Suzanne Elizabeth Cooney, Mary A. Turzillo, Laura Madeline Wiseman, Jennifer Givhan, Emily Wagner, Megan Arkenberg, and Rose Lemberg, as well as beautiful art by Paula Friedlander of Arwen Designs. Enjoy! And if you feel so moved, consider supporting us through Patreon or a direct PayPal donation. I'd also like to draw your attention to the updated Staff page. Response times at Goblin Fruit have been abysmal for the last two years, and I've not done much to address or explain it. It's a difficult subject to discuss and the particulars aren't mine (Amal) to go into, but suffice it to say that Goblin Fruit lost 2/3s of its staff within 3 months of 2012, with no notice or explanation, at a time when our submissions were at an all-time high and my own ability to cope with such a loss was at an all-time low. As a consequence we've accrued a mighty backlog that we're dealing with the only way we can: one submission at a time. Please believe that we are as frustrated by this as you no doubt are, as well as apologetic, embarrassed, and determined to improve. Ollie's last layout for us was this magnificent one for Fall 2011, and he's vaulted beyond Goblin Fruit in seven-league leaps since then; I don't expect him to return to producing work for us, though I'd be overwhelmed with delight if he did. Jess hasn't been directly involved with Goblin Fruit since April of 2012, but I held off marking it in any public way for several reasons, chief among them the fact that she'd had a hand in selecting poems that would be appearing over the next year and a half, and also the fact that I thought she might return by the time those poems were all published. She hasn't, and having now published all the work she was partly responsible for editing, it feels misleading to have a Staff Page where she appears to be an active editor. When you submit work to Goblin Fruit, it's read by a combination of Caitlyn Paxson and myself. Caitlyn's been a godsend throughout this behind-the-scenes restructuring; she began reading slush around the time that Jess went on break, and has been gradually taking on more responsibility where reading submissions is concerned. I tremble to think what response times would be like without her. She's fantastic to work with and I'm sometimes a bit devastated with gratitude for the fact of her. So I've listed Jess and Ollie as Founding Editors, which they are and will forever be no matter what they're doing presently. I miss them more than I can say, and would love for them to return to collaborating actively on Goblin Fruit with me, but so far as I can see that isn't in the cards. That's the state of things just now. We appreciate your understanding and patience more than you can possibly know. The Fall 2013 issue of Goblin Fruit is live! Enter at your own risk. In addition to a Feature on Mike Allen, this issue contains poems by Lynette Mejia, Samantha Henderson, Megan Arkenberg, Jason McCall, Beth Langford, Liz Bourke, Sonya Taaffe, J. P. Wickwire, Brianna Sulzener, and Leah Bobet. Their poems were very much the subject of this post on creating the order of a Table of Contents. The above photograph is graciously provided Raven Edgewalker, while the issue's artwork is courtesy of the amazing Orion Zangara. Enjoy! And if you find yourselves wondering how to ensure that there will always be such poems in the future, do feel free to support us with a donation. My sincere apologies, dear friends, but the Winter 2013 issue is a little further delayed; the present estimated time of arrival is February 14, though we are working hard to get it up earlier.